1) H.R.H Shahzada ‘Inayatu’llah Khan, Muin us-Sultanat, who succeeded as H.M. Amir al-Mumenin, ‘Inayatu’llah Shah, Sarkar-i-Wala, King of Kingdom of Afghanistan (s/o the Aliya Jah) - see below. a) Mahbubu’llah Khan Azud Siraj (s/o Zulaikha Begum). Sometime Dir-Gen of Civil Aviation. m. a German lady, and had issue. b) Burhanu’llah Khan Siraj (s/o Zulaikha Begum). m. an American lady, and lived in California. c) Qudratu’llah Hazrat Siraj (s/o the Chitrali lady). Served in the Monopoly Dept. He had issue. 3) H.R.H. Sardar Amanu’llah Khan, ‘Ayn ul-Daula, who succeeded as H.M. Amir al-Mumenin, Amanu’llah Shah, Sarkar-i-Wala, King of of Afghanistan (s/o Queen Sarwar Sultana) - see below. i) Sulaiman Kabir Seraj. He d. young. i) Benazir Kabir Seraj [Benazir Begum Ghaussy]. b. July 1946. m. Sa’adu’llah Khan [Dr Saadollah Ghaussy], son of Saud’din Khan Ghaussy, by his wife, Farukh Taj Begum, H.M. Siraj ul-millat wa ud-din, Amir al-Mumenin, Habibu’llah Shah, Sarkar-i-Wala, King of the God granted Kingdom of Afghanistan and its dependencies, GCB, GCMG. She had issue, three sons. ii) Nasrin Kabir Seraj [Nasrin Begum Ashraf]. b. 1948. m. Dr Yunus Ashraf, younger son of Muhammad Ashraf Khan, by his wife, Gulalai Begum, daughter of H.R.H Sardar Muhammad Kabir Khan [Kabir Jan]. She had issue, three daughters – see above. iii) Parwin Kabir Seraj [Parwin Begum Mahmood]. m. Ziaullah Mahmood. She had issue, two daughters. iv) Nadjla Kabir Seraj [Nadjla Begum Askarzoi]. m. Muhammad Mansour Askarzoi (Barakzai). She had issue, two daughters. (1) Alexander Turan Kabir Siraj. b. 6th March 1986. (2) Manuel Said Kabir Siraj. b. 5th June 1990.
c) Izatu’llah Jan Siraj. b. 1921. (1) Parniyan Kabir Seraj. b. 1st October 1979. (2) Malac Lily Kabir Seraj. b. 5th December 1987.
i) Samila Begum [Samila Koshan]. b. 1949 (d/o Rabia Begum). m. 1978, Qawi Koshan, Editor of weekly Afghan newpaper Omaid. She had issue, two sons. (1) Arash Raheen. b. 4th July 1975. (1) Elias Raheel. b. 31st May 1994. (1) Diana Raheel. b. 27th November 1990. (2) Naqiya Caderbhoy. b. 18th December 2003. (a) Samuel Lucas Seraj. b. 12th February 2008. (2) Sekander (Alexander) Kabir Seraj. b. at Kabul, 20th November 1979. (1) Laila Kabir Seraj. b. 25th September 1989. m. 5th July 2008, Haroun Mohammad (b. 8th January 1990). (1) Roxane Laetitia Kabir Seraj. b. at Paris, France, 20th June 1984 (d/o Anne Marie), educ. Lycee J.-B.-Say. (2) Natalie Kabir Seraj. b. at Santa Clara, California, USA, 16th November 1995 (d/o Zarmina), educ. Apex High Sch, Los Angeles, California, USA). (1) Mary Kabir Seraj. b. at Orange, California, USA, 11th February 1992. (2) Sophia Kabir Seraj. b. at Orange, California, USA, 17th February 1994. (1) Omar Kabir Seraj. b. in California, USA, 23rd July 1997. (1) Sabrina Kabir Seraj. b. in California, USA, 29th August 1989. (2) Dorana Kabir Seraj. b. in California, USA, 10th June 1999.
i) Zarina Kabir Seraj. b. at Kabul, 23rdMarch 1959 (twin with her sister Suraiya). m. (first) at Kabul, 1978 (div. at New York, USA, 1986), ‘Inayatu’llah Jan Enayat-Seraj (b. at Kabul, 25th October 1961), only son of Sardar Ismatu’llah Khan Enayat-Seraj [Iqbal Jan], by his wife, Maryam Begum, second daughter of Jalal ud-din Khan Tarzi, sometime Dir-Gen MOFA. m. (second) at Arlington, Virginia, USA, 9th October 1999, Muhammad Ashraf Khan Etemadi, elder son of Muhammad Anwar Khan Etemadi, by his wife, Humaira Jan Begum, daughter of Field Marshal H.R.H Sardar-i-Ala Muhammad Shah Mahmud Khan Ghazi. She had issue, one son by her first husband (see below), and one son and one daughter by her second husband - see Afghanistan (Itimadi). (1) Zachary Seraj. b. at San Remon, California, USA, 7th December 2004 (twin). (2) Yasmine Seraj. b. at San Remon, California, USA, 7th December 2004 (twin). (1) Ariana Nicole Tringali. b. 11th May 1998. (2) Sophia Marie Tringali. b. 6th August 2001.
a) Zakiya Begum (d/o Morawarid). m. Muhammad Yusuf. b) Gulalai Begum (d/o Samia). m. (first) Muhammad Ashraf Khan, son of Major-General Sardar Muhammad Yunus Khan, by his second wife, Hajira Begum, Okht us-Siraj, elder daughter of H.H. Zia ul-millat wa ud-din, Amir al-Mumenin, Amir ‘Abdu’l Rahman Khan, Amir of Afghanistan, GCB, GCSI. m. (second) 1971, as his second wife, H.E. Sayyid Muhammad Qasim Rishtia (b. at Kabul, 21st March 1913; d. at Geneva, Switzerland, 26th March 1998), educ. Istiqlal High Sch, and Institute of Economics, Kabul; Clerk Press Section MOFA 1932-1932, Chief Clerk Foreign Relations Section of Ministry of Communications 1932-1933, translater at Afghan Acad of Literature 1933-1934, Editor “Afghan Almanach” and “Kabul Magazine” 1936-1938, Vice-Presdt Publications Dvsn 1938-1940, Dir-Gen Publications 1940-1944, Presdt Publications Dvsn 1948-1949, of Govt Economic Planning Brd 1949-1952, Govt Co-operatives Org 1952-1954 and Bakhtar News Agency 1954, Ambassador to Czechoslovakia (conc. to Hungary and Poland) 1960-1962, Egypt 1962-1963, and Japan (conc. to the Philippines) 1970-1974, Minister for the Press & Finance 1964, settled in Switzerland 1979, author of “Afghanistan in the 19th Century”, “The Price of Liberty, the Tragedy of Afghanistan” (1984), “Between Two Giants” (1990), and “Memoirs” (1997), rcvd: decorations from Afghanistan, Egypt, Yugoslavia, Japan, and the Ivory Coast, widower of Nur Jahan Ziai, and son of Sayyid Habib Rishtya, by his wife, Zainab. She had issue, two sons by her first husband. c) Kulsum Begum. b. 1917 (d/o Tajwar). m. ‘Abdu’l Hadi Khan, eldest son of ‘Abdu’l Rahim Khan, by his wife Koko Begum, daughter of Sayyid Ahmad Shah. She had issue, three sons and four daughters. e) Gauhar Khanum. b. 1924.
f) Mastura Khanum. b. 1925.
g) Sabira Begum (d/o Tajwar). m. ‘Abdu’l Wali Khan, second son of ‘Abdu’l ‘Ali Khan, by his wife, Maryam Begum, daughter of H.H. Amir al-Mumenin, Amir Muhammad Yaqub Khan, Amir of Afghanistan and its dependencies. She d. 2000, having had issue, one son - see above. 7) H.R.H Sardar Hidayatu’llah Khan. a) Sulauman Khan Majid Siraj. He d. at Kabul, aged 15, after 1929.
i) Hamila Khanum Majid Siraj (d/o Safia Begum). 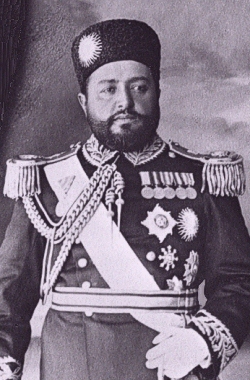 9) H.R.H Sardar Ahmad ‘Ali Khan. b. at Kabul, 14th June 1906, educ. Harbiya Military Sch, Bagh-i-Charmgarh, Kabul. He d. before 1939.
ii) ‘Abdu’l Rahman Khan Seraj. b) Fatima Begum. m. ‘Abdu’llah Khan Tarzi, youngest son of H.E. Ghulam Yahya Khan Tarzi, sometime Ambassador to the USSR, France and Hungary, by his wife, Rabia Begum, daughter of H.M. Siraj ul-millat wa ud-din, Amir al-Mumenin, Habibu’llah Shah, Sarkar-i-Wala, King of Afghanistan, GCB, GCMG - see Afganistan (Tarzi). c) Aisha Begum. m. Muhammad ‘Ali Khan Sulaiman (b. 1926), second son of Colonel H.E. Sardar Ahmad ‘Ali Khan, sometime Ambassador to Persia, by his wife Mahbuba Begum, second daughter of Crown Prince Muhammad Musa Jan. She had issue, one son and one daughter - see Afganistan (Asifi). d) Habiba Begum. m. Hamid Husaini, second son of Haider Husaini, of Herat, by his wife Haliba Begum, fifth daughter General H.H. Sardar Muhammad Sulaiman Khan, sometime Governor of Herat and Badakhshan. She had issue, one son and one daughter. i) Mina Khanum Seraj. b. at Istanbul, Turkey, 10th March 1980.
i) Canan Öcal. b. 29th November 1988. 13) H.R.H Sardar Ghulam Haidar Khan (s/o Queen Sarwar Sultana). He d. young. 14) H.R.H. Sardar Ghulam Muhammad Khan (s/o the Nawab Jan). He d. young. (1) Malvina Seradj. b. 31st January 1995 (d/o Monique). (2) Lara Seradj. b. 12th April 1996 (d/o Monique). (3) Lou Seradj. b. 11th August 2005 (d/o Marine). ii) Yann Seradj. b. at Paris, France, 2nd February 1968. He d. in a traffic accident, at Fresnes, France, 8th June 1982. (1) Samuel Griesbeck. b. at Lauterburg, Lower Rhine, Germany, 6th November 1989.
c) Hafizu’llah Khan Siraj. m. Maimuna Begum, eldest daughter of Sardar ‘Abdu’l Wahid Khan, by his wife Amina Begum, third daughter of Major-General Sardar Muhammad Yunus Khan. a) ‘Ali Muhammad Wahid Siraj. b. 1949.
i) David Doran Seraj. b. at Los Angeles, California, USA, 2nd December 1993.
i) Yasmine Seraj. b. in Washington state, USA, 14th July 1998.
a) Maimuna Begum. m. Fafizu’llah Khan Siraj, youngest son of Sardar ‘Abdu’llah Khan, by his wife, Aisha Begum, fourteenth daughter of Field Marshal H.R.H. Sardar Nasru’llah Khan, Naib us-Sultana, Itwad ud-Daula, GCMG - see above. b) Ariana Begum. m. her cousin, Muhammad ‘Umar Khan Siraj, eldest son of Sardar Muhammad Faruq Khan, by his wife ‘Aliya Begum, fourth daughter of General H.H. Sardar Muhammad Sulaiman Khan, sometime Governor of Herat and Badakhshan - see above. 18) Sardar Muhammad Amin Khan [Amin Jan]. b. at Kabul, before 3rd March 1911 (s/o a Hazara Consort), educ. in Germany. Involved in a tribal uprising in favour of Amanullah, February 1930. Arrested, exiled and placed under surveillance int Kalaw, Burma 1930-1937, and Kotagiri, in the Nilgiris, Madras Presidency 1937-1948. Escaped from India when granted 7 days perole. Arrived in South Waziristan and attempted to raise the Shinwaris in favour of Amanullah, but failed on account of a shortage of funds. Thereafter lived under the protection of the Mahsuds. m. at Colladia, Ootacamund, 20th March 1942 (div. at Madras, 3rd December 1947), Irene Margaret (b. at Windsor, Berks., 1911), widow of David Solomon, and daughter of James Digby. 19) Sardar ‘Abdu’l Samad Khan. b. 1911 (s/o Banafsha Begum). m. Mastura Begum, a Barakzai, and had issue, several children. i) Tamara Seraj [Mrs Tamara Seraj Thomas]. b. at Kabul, 11th January 1976 (d/o Karen), educ. Pitzer Coll, Claremont, California, USA. m. (first) at Clark, Nevada, USA, 14th March 1999 (div. ), Eduardo J Sanchez. m. (second) at the Belleza Wedding Chapel, Las Vegas, Nevada, USA, 18th April 2015, James N. Thomas. She had issue, two children by her first husband. ii) Sabrina Seraj [Dr Sabrina Seraj-Villanueva]. b. at Los Angeles, California, USA, 14th May 1981 (d/o Karen), educ. Alta Loma High Sch, and Univ of Southern California (DPT 2006), Los Angeles, USA. Licensed Physical Therapist 2006. Clinical Instructor American Physical Therapy Assoc (APTA). Mbr Kinesio Taping Assoc (KTA). m. 2012, Mark Villanueva. i) Sahar A. Seraj [Mrs Sahar Ross-Wiley]. b. 6th October 1975 (d/o Maribeth). m. at Westbrook, Middlesex, Connecticut, USA, 2001, Jonathan Michael Ross-Wiley (b. 5th September 1973). She has issue, two children. ii) Safia E. Seraj [Mrs Safia Webb]. b. 5th January 1978 (d/o Maribeth). m. 2005, Robert Webb. She has issue, two children. iii) Alia E. Seraj [Mrs Alia Cavallaro]. b. 15th September 1982 (d/o Maribeth), educ. Emerson Coll, Boston, Massachusetts, USA. m. at the Webb Barn, Wethersfield, Connecticut, USA, 26th June 2012, Jason Cavallaro (b. 22nd December 198x). She has issue, one child. a) Salma Begum [Salma Seraj Etemadi]. b. 14th June 1949. m. Tamim Etemadi, eldest son of H.E. Nur Ahmad Khan Etemadi, sometime Prime Minister, by his wife ‘Aliya Begum, daughter of Juma Khan. No issue - see Afghanistan (Etemadi). b) A daughter, who d. young. a) Abida Begum. m. Jahid Khan Wali. c) Razia Begum. m. Muhammad Asadu’llah Mujaddidi. a) Habibu’llah Khan Seraj. m. a daughter of Akbar Muhammad Khan. b) ‘Abdu’l Habib Khan Seraj. Consul at New York 1994-1998, Consul-Gen at New York 1998-2002.
a) Muhammad ‘Umar Khan Siraj. m. his cousin, Ariana Begum, youngest daughter of Sardar ‘Abdu’l Wahid Khan, by his wife Amina Begum, third daughter of Major-General Sardar Muhammad Yunus Khan. a) Saleha Begum. m. as his second wife, H.E. Muhammad Amin Khan Etemadi (b. at Kabul, 1924), sometime Ambassador to Poland, fifth son of H.E. Muhammad Haidar Khan Etemadi, sometime Dep. Minister of the Royal Court, by his wife Shahzada Begum, daughter of Colonel Sardar Muhammad Yusuf Khan. She had issue, three sons - see Afghanistan (Etemadi). a) Hosse Begum. m. Bahaud-din Majruh, by whom she had issue one son. a) ‘Abdu’l Rahman Khan Seraj. i) Shams Ahmad Khan Seraj. ii) Helios Ahmad Khan Seraj. a) Mahuba Begum. m. 1974, Azimu’llah Khan Nasser-Zia (b. 24/25th March 1949), eldest son of Sardar ‘Atau’llah Khan Nasser-Zia, by his wife, Humaira Begum, third daughter of H.M. Amir al-Mumenin, ‘Inayatu’llah Shah, Sarkar-i-Wala, King of Afghanistan - see above. b) ‘Aliya Begum. m. Zaid Siddiq Khan Charkhi, younger son of H.E. Sardar-i-Ala Ghulam Siddiq Khan Charkhi, sometime Private Sec to the King, by his third wife H.H. Princess Bibi Khurd, Huraya Begum, DBE, youngest daughter of H.E. Sardar-i-Ala Mahmud Beg Tarzi, sometime Minister for Foreign Affairs. 29) Sardar ‘Abdu’l Wahab Khan. b. 1916 (s/o Shabo Begum). i) Adam Seraj. b. 1986.
i) Darya Seraj. b. 1992.
b) Mahmood Seraj. He d. 1962.
i) Sultan-Mahmood Seraj. b. 25th June 1996.
ii) Dawoud Seraj. b. 26th March 1999.
b) Mahboob Begum. m. (first) ... Ahadi. m. (second) ... Khan. She had issue, two sons by her first, and one son and one daughter by her second husband. 31) Sardar ‘Abdu’l Fattah Khan (s/o Wasi-i-Khurd). He d. young. 32) Sardar ‘Abdu’l Wasi Khan. b. 1918 (s/o Sanawbar Begum). m. a Swiss lady. 1) H.R.H. Princess Afaq Sultan Begum, Shams ul-Banat. b. at Kabul, before 1901 (d/o the Aliya Jah). Lived in exile in Tehran 1929-1972. m. at Kabul, 1925 (div. 1927), Sardar ‘Abdu’l Wahid Khan (b. 1898), son of H.E. Sardar Muhammad Ibrahim Khan, sometime Governor of Kabul, by a Safi lady. She d.s.p. at Kabul, 1974 - see above. 2) H.R.H. Princess Safura Begum, Qamar ul-Banat. b. at Kabul, 1902 (d/o Gulshara Begum). m. at Kabul, December 1920, Field Marshal H.R.H Sardar Shah Mahmud Khan Ghazi (b. at Dehra Dun, India, 1890; 27th December 1959), fifth son of Colonel Sardar Muhammad Yusuf Khan, by his first wife, Shahzadi Sharaf Sultana Hukumat Begum, daughter of Shahzada ‘Ali Ahmad Khan Bahadur, of the Durrani dynasty. She had issue, three sons and six daughters - see Afghanistan (Telai). 3) H.R.H. Princess Sahira Begum, Siraj ul-Banat. b. 1902 (d/o Queen Sarwar Sultana). m. at Kabul, 1919, as his second wife, General H.E. Taj-i-Afghan ‘Ali Ahmad Jan Shaghasi (b. 1883; k. when he was shot from a cannon at Kabul, 11th July 1929), sometime Minister for Home Affairs1919-1920, Governor of Kabul 1925-1929, proclaimed himself Amir at Jalalabad on 17th January 1929 after the departure of King Amanu’llah, defeated by Habibu’llah Kalakani at Jagdalak in February 1929, captured at Kandahar, 9th May 1929 and sent as a prisoner to Kabul, son of General H.E. Loinab Khushdil Khan, sometime Governor of Kabul and Kandahar, by his wife Sahira Begum, daughter of H.H. Amir al-Mumenin, Amir al-Kabir, Amir Dost Muhammad Khan, Amir of Afghanistan, by his wife, a daughter of Agha Muhammad Qizilbash. She had issue, one son and one daughter. 4) H.R.H. Princess Safia Begum, Samarat us-Siraj. b. at Kabul, 1904 (d/o Queen Sarwar Sultana). m. at Kabul, 8th May 1920, Field Marshal H.R.H. Sardar Shah Wali Khan Ghazi (b. at Dehra Dun, India, 16th April 1888; d. at Rome, April 1977), sometime Ambassador at the Court of St James’s, third son of Colonel Sardar Muhammad Yusuf Khan, by his first wife, Shahzadi Sharaf Sultana Hukumat Begum, daughter of Shahzada ‘Ali Ahmad Khan Bahadur, of the Durrani dynasty. She had issue, three sons and one daughter - see Afghanistan (Telai). 6) H.R.H. Princess Razia Begum, Nur us-Siraj, DBE (c 3.3.1928). b. 1909 (d/o Queen Sarwar Sultana). at the Dilkusha Palace, Kabul, October 1927, H.E. Sardar-i-Ala Muhammad Hasan Jan, GCVO (b. 1908), Court Chamberlain and Civil ADC to King Amanu’llah, fourth son of Sardar Muhammad ‘Umar Khan [Omar Jan], by his Shighnani Consort, Bibi Daulat. She had issue, one son and one daughter - see above. 7) H.R.H. Princess Aisha Khanum (d/o the Aliya Janab). She d. young, after 1918. 8) H.R.H. Princess Zahra Begum (d/o the Nawab Jan). She d. young. 9) H.R.H. Princess Khawar Khanum (d/o Sandal Begum). She d. young. 10) Gauhar Begum (d/o Zarin Begum). m. Safdar Khan, son of Sardar Juma Khan, by his first wife, Zarin Taj Begum, daughter of Sardar Sultan Ahmad Khan. She had no issue. 11) Shah Jahan Begum (d/o Zarin Begum). m. as his second wife, Ghulam Haidar Khan Etemadi, son of General H.E. Sardar ‘Abdu’l Quddus Khan, Itimad ud-Daula, sometime Prime Minister, by his fourth wife Tajwar Bibi Jan, eldest daughter of Sardar Muhammad ‘Ali Khan. She had issue five sons and one daughter - see Afghanistan (Etemadi). 12) Farukh Taj Begum (d/o Zarin Begum). m. Saud’din Khan Ghaussy, son of General Ghaus ud-din Khan Logari. She had issue, one son and five daughters. 13) Hawa Begum (d/o Zamarud Begum). m. Major-General ‘Abdu’l Rauf Khan Tarzi, former husband of H.H. Princess Bibi Khurd, Huraya Begum, DBE, and third son of Habibu’llah Beg Tarzi, by his wife Kauteba. She had no issue - see Afganistan (Tarzi). 14) Rabia Begum I (d/o Zamarud Begum). m. H.E. Ghulam Yahya Khan Tarzi (b. 1898), sometime Ambassador to the USSR, France and Hungary, son of Naib Habibu’llah Beg Tarzi, by his wife Kauteba Begum. She had issue, three sons and four daughters - see Afganistan (Tarzi). 15) Hanifa Begum (d/o Zamarud Begum). m. Jalal ud-din Khan Tarzi (b. 9th February 1912; d. at Flushing, New York, May 1981), sometime Dir-Gen MOFA, fifth son of Naib Habibu’llah Beg Tarzi, by his wife Kauteba Begum. She had issue, two sons and three daughters - see Afganistan (Tarzi). 16) Rabia Begum II (d/o Khairbanu Begum). m. Sardar ‘Abdu’l Rauf Khan, eighth son of Field Marshal H.R.H. Sardar Nasru’llah Khan, Naib us-Sultana, Itwad ud-Daula, GCMG, by his fifth wife, Shirin Begum - see above. 17) Maliha Begum (d/o Yasmin Begum). m. H.E. Sardar Muhammad Anwar Khan Ziyai (b. 1915), sometime Minister for Finance, ninth son of Sardar Muhammad ‘Umar Khan, by his wife, Bibi Mazari, daughter of Sayyid Nazir. She had issue, two sons and two daughters - see Afganistan (Ziyai). 19) Uzra Begum (d/o Hakima Begum). m. Sayyid ‘Abdu’l Ahad, by whom she had three daughters. 20) Saleha Khanum (d/o Nilum Begum). She d. young. 21) Rahima Begum (d/o Maryam Begum). m. as his first wife, Sardar H.E. Sardar ‘Azizu’llah Khan Ziai (b. at Kabul, 19th May 1892; d. at Kabul, 10th March 1934), sometime Ambassador to Iran, eldest son of Field Marshal H.R.H. Sardar Nasru’llah Khan, Naib us-Sultana, Itwad ud-Daula, GCMG, by his first wife, Bilqis Koko Jan. She had issue, three sons - see above. 22) Aziza Begum (d/o Maryam Begum). m. Sardar ‘Abdu’l Baqi Khan, second son of Sardar ‘Abdu’l Rahim Khan, by his wife Sayyida Koko Begum, daughter of Sayyid Ahmad Shah Khan. She had issue, one son and three daughters - see above. 23) Sharifa Begum (d/o Nek Qadam Begum). m. H.E. Sardar Dr Najibu’llah Khan Sultan (b. at Jalalabad, 24th February 1914), sometime Ambassador to India, eldest son of Major-General Sardar Muhammad Yunus Khan, by his first wife, Fatima Begum, daughter of H.H. Zia ul-millat wa ud-din, Amir al-Mumenin, Amir ‘Abdu’l Rahman Khan, Amir of Afghanistan, GCB, GCSI. She had issue, two sons - see above. 24) Aqila Jan Begum (d/o Basu Begum). m. H.E. ‘Abdu’l Aziz Khan Sultan, sometime Governor of various provinces, son of Sultan Aziz Khan. She had issue, one son and two daughters. 25) Shafiqa Begum [Bibi Jan] [Princess Shafiqa Saroj](d/o Rabili Begum). A journalist. m. Muhammad Naim Khan, youngest son of Muhammad Hakim Khan Azimi. She d. at Peshawar, Pakistan, April 2004 - see above. 27) Farukh Begum (d/o Sultanat Begum). m. Dr ‘Abdu’l Qayyum Khan Sarkar, youngest son of ‘Abdu’l Rasul Khan Sarkar, of the Afghan Foreign Service, by his wife, Aisha Begum, a daughter of Qazi Nur ud-din Khan Barakzai, sometime Judge of Kandahar. She had issue, two sons and one daughter - see Afganistan (Herat). 28) Habiba Begum (d/o Kawik Begum). m. as his second wife, Khodadad Khan Etemadi, son of General H.E. Sardar ‘Abdu’l Quddus Khan, Itimad ud-Daula, sometime Prime Minister, by his wife, Gulpari Begum, his Nuristani Consort. She had issue, two sons and three daughters - see Afghanistan (Etemadi). 29) Karima Begum (d/o Amshahi Begum). m. as his first wife, Muhammad Rahim Khan Rafiq, eldest son of Sardar Muhammad Rafiq Khan, sometime Lord Chamberlain and Presdt. Shirkat-i-Rafiq, by his first wife, Humaira Begum, daughter of Sardar ‘Abdu’l Rahman Khan, of Herat. She had issue, one son and one daughter - see above. 30) Khadija Begum. b. at Kabul, 1914 (d/o Bulbul Begum). m. at Kandahar, 1929, ‘Abdu’l Wahab Tarzi, CVO (b. at Damascus, 24th November 1903; d. at Geneva, Switzerland, 20th January 1994), second son of H.E. Sardar-i-Ala Mahmud Beg Tarzi, Minister for Foreign Affairs, by his second wife, Asma Rasimia Begum, daughter of Shaikh Muhammad Saleh al-Fattal Effendi, of Aleppo, Muizzin of the Umayyid Mosque at Damascus. She d. at Geneva, Switzerland, 11th November 1995, having had issue, one son and one daughter - see Afganistan (Tarzi). 31) Kamila Begum. b. at Kabul, 1916 (d/o Astani). m. Sardar Muhammad Karim Khan (b. at Kabul, 1906; d. at Hannover, Germany, 2002), third son of Sardar Muhammad ‘Umar Khan, by his Nuristani Consort, Pari Begum. She d. at Hannover, Germany, 2002, having had issue, two sons and two daughters - see Afganistan (Ziyai). 32) Fatima Khanum (d/o Wasi-i-Kalan). She d. young.